A 1991 graduate of the Virginia-Maryland Regional College of Veterinary Medicine, I have lived and worked in the DC area since 1967. I truly appreciate the value of providing the excellent care and service that ensur﻿e a loyal clientele. ﻿Our staff includes two receptionists, Rhoda and Suzie, and four technicians, Rhonda, Victoria, Aaron, and Carmen. Bridget provides administrative support. "I've always had a keen interest in animals and knew from an early age I wanted to work with them. I love the variety of working in an animal hospital where there's always something interesting happening. I am constantly learning new things. When I'm home, I enjoy my four fat & easily excited rats." 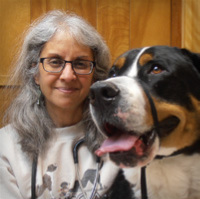 ﻿"I have worked as a veterinary technician for the past 7 years at Silver Spring Animal Hospital. I have had pets all my life from cats, dogs and hamsters to an 11 foot long red tail boa constrictor. I now have one elderly cat named Sierra. In my free time I enjoy hiking, camping and BBQing with friends and family. I highly enjoy working with all the wonderful pets and people at Silver Spring Animal Hospital and look forward to seeing you." Photography cannot be reproduced without written permission.